I had the very lucky opportunity to attend GenCon this past July and there were some particular reasons for wanting to attend. Aside from partaking in some FFG tournaments, I wanted to find some new products for the painting studio. Leading up to the event I knew that there were going to be some smaller miniature/games companies and I also knew that there were going to be some painting hardware that I wanted to lay my hands on. I had seen numerous Facebook posts about Games and Gears brush sets and unsure about preordering a set, I ultimately decided to simply walk up to the booth at the ‘con. With a solid plan, I scoured the vendor hall and found booth #718 that had the brushes on sale. There were two sets that I spied and picked up, The GenCon exclusive Collectors series (of which a review will come soon as it contains the very special brush named the Xtreme Kitana) and The Ichiban Synthetic brush set, of which this review is based around. I really liked the feel of the brush in my hand, weight-wise at the ‘con. It seemed to be balanced very well and the construction of the handle, being made of what looks to be a type of aluminium, lends itself to being weighted well. The Ichiban set came as a set of three, in a leather pouch, so I decided to pick up a set, along with the GenCon exclusive set. I got these brushes home to Canada and started to use them in a current commission that I had to put on hold whist I attended what is touted as being “The best four days in gaming” (trademarked by GenCon). With no hesitation, I decided to use the size #3 for work on a Landraider Crusader hull for a Deathwing army. This brush was able to give me great coverage over the larger panels, with minimal stress to the brush. As I got further along, I needed to employ the size #2 to the main bone work of the hull for the crusader. This brush quickly took a hit to the tip. I have found that with many brushes, the make or break of the brush, for me is just how the tip holds up to my painting. I know many painters dislike Games Workshop brushes for the quality, but if a brush can’t keep it’s tip, then that caused me more hassle than I need. I then moved onto the finest brush of the set, the #1. The size of this equates to something inbetween a Standard Games workshop brush and their Basecoat brush, so it was perfect for getting some finer details on the hull panels for the Crusader. This brush has really kept it’s point while I edged all of the panels of the Crusader. I am really happy with this brush. All in all I am somewhat, to pleasantly pleased with the overall set of brushes. I really wish the brush sized #2 kept its tip, as that is the one I really wanted to have do the majority of the Landraider Crusader armour, but this is something I am finding with synthetic brushes, so maybe I am working them too hard? I had barely been using the brush for 12-20 hours of work and found a poor result here. The way in which the handle switches back to provide a cover for the brushes, is a great idea, especially if I should transport them to painting classes. They come in a great case to protect them. The size #3 gives really good, smooth coverage, with a great paint yield. Perfect for doing medium, to large panels for vehicles. The size #1 holds a point well, and this is really good for highlighting larger panels. This size, once again, gave me great paint yield, before I had to re-dip onto my palette for some fresh paint. Size #2 lost it’s fine tip much faster than I expected, but I did put it to work very hard once I started. Overall I am pleased with the set, and if I could purchase the size #1 individually, I would, since it is a really great in between size for me, and one that would see a lot of application for me. If Games and Gears were to allow an individual purchase of the brushes, I would be all over that. If this was the case, then the brushes would score a solid 8/10, but seeing as I must purchase them as a set, I would rate them a 7/10 as I cannot afford to have one brush die so fast, with the other ones left laying around. Gen Con 2015- I made it there AND back. So I have returned from a awesome time in Indianapolis for my very first GenCon. Among playing lots of games, and playing in a few tournaments, I spend my Sunday connecting with a ton of game and miniatures companies. It was fantastic to chat with those who are in the industry and there were quite a few miniature companies just starting off. I have brought back a ton of minis to paint up and get them looking good for the blog. Hopefully those of you who follow this blog may see something that you like and mention the new stuff to any friends who may collect them. The goal here is to paint up some really different pieces and to build up my repertoire to show my range and skills. Keep your eyes peeled for some new stuff that is in the works! The studio has undertaken a commission to paint up three of the Lieutenants from Descent, Journeys In The Dark. This is a questing game or a”dungeon crawling” game that I have yet to play, but looks very similar to a game that I used to play in the ’90s called Warhammer Quest. I had some downtime last evening, where I thought it would be great to simply clean up the models ready for the start date of the commission for the client, which isn’t for a while yet. The models I received were three Lieutenants: Belthir, Bol’Goreth, and lastly Valyndra, the Wyrm Queen. Valyndra is the model that I want to specifically talk about today. I find the cleaning up of models, really satisfying, but it can be tedious. There is nothing more unsightly than a model that has has a lot of time being painted with mould lines showing. I really felt that as I was developing my abilities as a painter many years ago, even if I couldnt get an ‘Eavy Metal studio paint job on my models, if I could clean the miniature up well, then it helped the aesthetics of the model immensely. I really like to go to town and clean as much off as I can and well sometimes you just can get all, without damaging the model, but I really attempt to have the light shine on the model, to help with finding as much of the mould lines as I can. With this being my very first Descent experience, I immediately found that the model was sculpted in a very beautiful manner. I could tell that there was a major difference in the time required to assemble a Descent model, compared to that of Games Workshop (you could easily spend hours assembling a few models from GW, but that is half the fun). Now dont get me wrong, I understand that the miniatures serve two different markets of gamers. Wargaers who play Warhammer Fantasy or 40k, are modellers and painters as well as gamers and as such command a different level of interaction with the assembly of their models. They like to be able to have multiple parts, so that they can easily convert up models so that one, say, High Elf Lord on a Dragon is different from somebody elses. Whereas gamers who play games with miniatures such as Descent, or Relic, or even Mansions of Madness are primarily board gamers and as such they are a demographic that just want to open the box, setup the game and go for it. I found that there was a really fine mould line on Valyndra, so immediately I got out my set of files and hobby knife and began to clean up the plastic. The plastic was just shearing off from the edge of the model, making it a really effortless task. I did notice one significant quality to the plastic, of which I will get into in a moment. The mould line, being such a fine line here, was at times a little hard to detect. That actually is a good thing because someone who doesn’t want to do any prep work whatsoever (and for Descent, most don’t) can be assured that they have a high quality miniature that is professionally made. It was clear on certain parts of the body, that because the Wyrm has had the major assembly done prior to packaging, there were slight gaps or minor misalignments evident, but nothing that I couldn’t fix. Now, as I was filing away I noticed that the plastic was an extremely soft, bendy plastic that I suppose lends itself well to board games miniatures. Its better that if a miniature is dropped, that it bend under the fall. I have noticed that all Fantasy Flight minis for their board games use this particular type of plastic. The main thing I was concerned with is just exactly what type of glue to use here. The two main glues that I have are super glue and polystyrene cement. Super glue is used for any metal miniatures and polystyrene cement is a glue that is used for plastics where you apply a small amount to each of the sides to be stuck together and wait a few seconds. What actually happens here is that it melts the plastic a little and then when you press the two pieces together, the pieces “melt” together and eventually set, resulting in something that is glued together. I did a little research and found that the material used in production is actually a vinyl plastic, therefore super glue won’t do the trick. Poly cement won’t be as effective as if I were to be gluing GW plastics, so I had to investigate another product. It was something that I actually had already and was called The Last Glue and it is composed of something called Cyanoacrylate. It bonds when the two sides are deprived of oxygen, so if I were to get any on my fingers, everything would be ok, until I touch the two together (which I think is a normal reaction) and it is strong, really strong. I had recently run out, so an order was placed and should arrive in perfect time to glue together Valyndra. I think my point here is I really like the plastic that FFG use for their miniature products in the preparation, now I just need to get the mini stuck together and painted. There will be many photos of the painting process, so keep on checking back in the future. Well, I had decided on undertaking The Aurora Chapter as my army. The colour was nice, the rules were simple for a newbie, that is I didn’t have to go and get Codex Space Wolves or Angels of Death. I then headed out to expand my abilities for the army, in the form of Dark Milennium. This add on was a box that had all sorts of cool wargear cards and as I was taking a dreaded Librarian, my opponent was done. He had planned on using the Orks and there was no way to stop me with my new, cool wargear. I also had another secret weapon; an Eversor Assassin, which would absolutely decimate my opponent’s Orks. Little did I know he actually had been scheming to build a brand new army, one that I didn’t know much about and that were the TYRANIDS! Well that begun the famous war between The Aurora Chapter and Tyranids. Over time as the armies developed and new editions were released, both of us have “evolved” our lists to combat each other better and better. 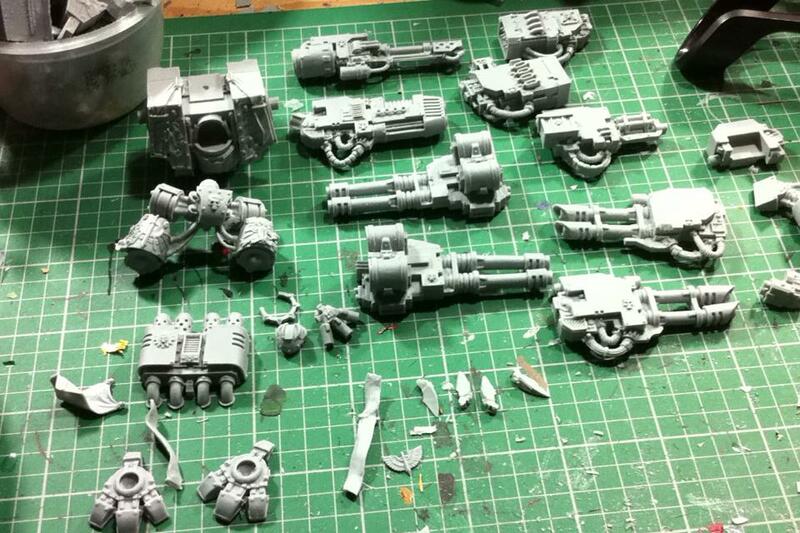 The Aurora have started taking much more bolter weaponry, both in the form of heavy bolters, and storm bolters. I started toying with a Whirlwind, and a Land raider Crusader. Now I even though I havent played against Steve in a long time (I moved overseas) I have now taken a Thunderfire Cannon, simply since my mindset is heavy firepower in the form of making my opponent take armour save, after armour save and whittle him down with the saves he fails. A sheer amount of firepower is the key. Now The Aurora Chapter’s third company is almost completely painted. The most recent tidbit of information about the Chapter had mentioned that they take a large contingency of Predators,(news to me) there should be some more rolling out from the Manufatorums on Mars, also I just have to paint up one or two more tactical squads and also, with a Thunderhawk slowly, and i mean slowly being done, an Apocalypse game is in the works, we will just see when we can get that organised. It is really interesting to see just how the Tyranids have evolved with the latest edition being a shootier game and it’s all about scoring units, time will tell. The return of Templars and yes we’re back in the studio! One commission that has just been finished are a unit of Black Templar Sternguard. These models are an absolute joy to assemble and paint. The sheer number of options are just so exciting. The potential here for conversion is just so palpable and any bits left over will most definitely find their way into many other conversions. These models from the beginning, were a joy to assemble, and paint. At times were a little overwhelming with just the sheer number of options available on the sprue. There are many, many bits left over to use for a squad or two. It seems like finally GW are really listening to their customer base. This is something I want to explore in another post, for the time being back to the Sternguard. When I was painting the models some things came to mind that I wanted to showcase. With the unit being of such an elite status, I really wanted to show them being veterans with their helmets looking really different from that of crusader squads The tactical squad equivalent in a Space Marine army. I felt that when you look at them next to each other on the battlefield, there should be a vast distinction between the regular squads and the veterans. Another way was to paint the black armour in a slightly different way. I wanted to keep it as similar to the crusader squad that I had previously painted for my client, but during the process I made a fatal error, one that basically erased my work on the armour up to that point. I wanted to make it as rich in colour as possible, so what did I do? i gave the armour a black glaze. This wiped out hours of my painting time and brought the black armour to a point at which I couldn’t really discern what I had done. What did I do I hear you ask? I started to blend on the armour. Now this would be a really silly idea if I was painting a regular unit and it would be even sillier if I didn’t have my saving grace; my wet pallet. This allowed me to keep my paints nice and moist, while I worked my colours on the models. In the end I am really happy with the outcome. The last way that I was able to have them stand out was through no accomplishment of my own. They have all been given beautifully sculpted robes, that are just perfect for Templars and they all have ornate boltguns and shoulder pads. By painting the Crux Terminatus and the robes in their own distinct style, I could keep the pallet for the unit to be black, white and bone. This is especially effective in tying them to the remainder of the army, yet keeping them looking like they had been through years of campagns. Here we see a recently completed commission for a client wanting six heavy weapons for his Blood Angel tactical squads. This was a particularly enjoyable commission in that it was super easy to achieve a stunning result in no time at all. The scary thing is now I will just have to paint up my own unit for my army. Available for commission work all the time. Just drop me an email to discuss your needs.